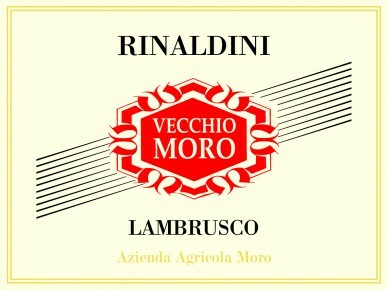 Lambrusco “Vecchio Moro” was produced for the first time in 1996 on the occasion of the centenary of the birth of “Nonno Moro” (Grandfther Moro). The idea behind this wine was to create a Lambrusco with the traditional features of the Lambrusco of former days. This lead to the grapes being chosen for its production: Lambrusco Grasparossa (85%), Ancellotta (10%) and Marzemino (5%), measured out with masterly skill. At the last stage of ripening, these grapes are followed up very closely , in order to obtain the best peculiarity of each one: Grasparossa’s tannins and acidity, Ancellotta’s fruity taste and color, Marzemino’s aromatic and full-bodied flavor, matching so well all together. Thanks to the modern concepts of vinification and elaboration, Vecchio Moro is a wine suitable for the most demanding palates, obtaining a soft, charming and well-balanced wine, surprisingly full-bodied thanks to the important velvety tannins. The color is intense ruby red in color with red foam. Ample nose with dense, grapey notes of red and black fruit. Well-structured on the palate, full-bodied with elegant tannins and a clean finish. Fine bubbles. It surprises for its versatility. It pairs well with all Emilian cooking: lasagna, pasta al ragu’, cold cuts and cheese (Prosciutto di Parma, mortadella, salame, Parmigiano Reggiano) and savory meat dishes. Integrated vineyard management using pesticides only when necessary. Late harvest and temperature-controlled fermentation “in rosso” on the skins. Second fermentation is at controlled temperature in autoclave with cultivated yeasts.